I just returned from a mission trip to Costa Rica. This was my fifth trip to Costa Rica. The country is full of breathtaking natural beauty. Most folks visit Costa Rica to enjoy this beauty. Many head to the Pacific coast to a resort, maybe surf, or enjoy the excellent offshore fishing. 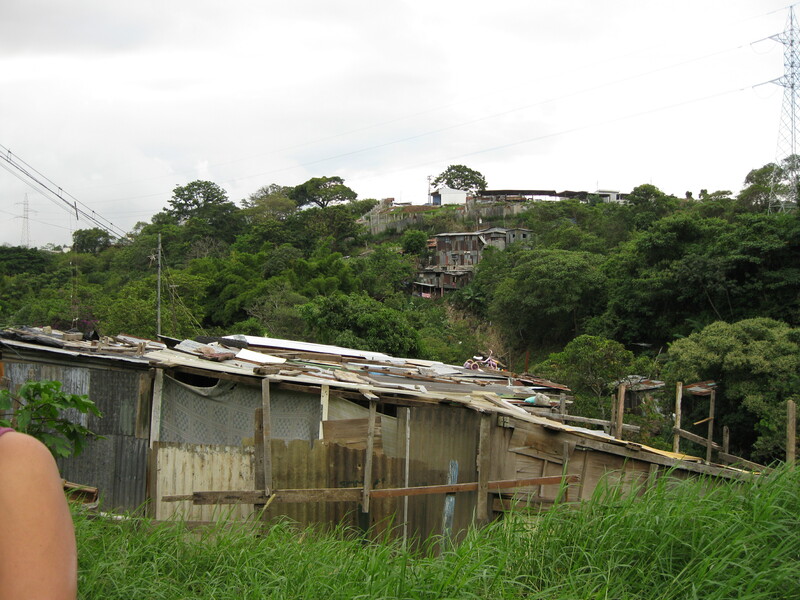 On our trip, we went to the very poor barrios surrounding San Jose in the central valley. These areas are filled with tin covered shacks packed together on the hillside. VERY, VERY, tough living conditions. Most of these neighborhoods are squatter communities. Very little in sanitation and services that we have come to expect here in the States. It is a bit of a sensory overload visiting these barrios- lots or colors, sounds, smells and movement. Children and dogs everywhere. Sounds of life. Colors cobbled together in scraps of tin and salvaged doors and building materials. The thing that has always amazed me about Costa Rica is that the Costa Rican’s are generally very happy people. Yes, there is strife and hardship in the poor barrios, yet even there, you will see smiles, laughter and life. If we subjected the average American to the conditions in Costa Rica they would be miserable. So who is really poor? We seem to equate the word “poor” to money. We think that money will solve our problems. Money can make us happy. Right? Well, I got news for you. I have seen the Costa Rican’s lifestyle first hand and I believe they may actually be the rich ones. In the US, we are slaves to our lifestyle. We struggle to gather and save. We strive to buy the best things. We work ourselves to death- really– in order to sustain our wealthy lifestyle. Results: pain, suffering, disease- AND- complaining, heads down, depression. They value their families! We talk about having close family relationships but the Costa Rican’s do it on steroids. Most live in the same areas their whole life. In the US, we are transient. We move away from our families, often, again to make more money. Costa Rican’s care for each other when times are tough. In the US, we often let the government take care of our families. In Costa Rica it is common to have extended families living in the same household. They understand what it means to be a family and to take care of our own. They live slower! In Costa Rica things get done when they get done. If it takes longer they are OK with it. This has been frustrating for me in the past working on construction project in Costa. They don’t fret over the time. We struggle so hard to pack it all in. In Costa Rica, there is alway mañana (tomorrow). They have strong community! In even the poorest areas, the Costa Rican’s know their neighbors and understand the power of living in community together. They take the time to stop and greet their neighbors. They watch out for their neighbors children. They help each other when they are sick. In the US, most folks don’t even know their neighbors! They let you in! We are so guarded. We are cautious to let anyone into our lives. Costa Rican’s invite you into their house. They want you to sit down and they will often bring you a drink or some food. They are not worried about whether their house is messy or if they have something really impressive to share. They share what they have. They welcome in strangers. They want you to sit down and relax. They walk! The streets are filled with life with sidewalks filled with people walking. Walking leads to interaction with others. In the ten years or so that I have been visiting Costa Rica, car ownership has grown significantly, yet walking remains a way of life. Walking up and down mountainous steep paths and walking to shopping and visiting friends is the natural order of things. I am sure that this exercise contributes to the longevity that Costa Rican’s enjoy. Living a life that extends well into their 90s is not uncommon. So my question again- are we really rich? Seems like the things that we gather and our lifestyle may be more of a hindrance than a benefit. Can we dump the stuff that we end up serving? Can we take the time to develop community? I’m not sure that we can go back-completely. The genie is out of the bottle. I can even see Costa Rica changing as we bring them added wealth and raise the expectations. I pray that they can hold on to riches that they have! So who is really living the rich life? Seems like we have a lot to learn from our friends in Costa Rica! So what do you think? Are we as rich as we think we are? Have you noticed the difference when you visit other cultures? Click on “Leave a Comment” and tell me what you think! Great article, Joe! I totally agree…any culture that embraces and cares for their family and community is much richer for it! Yes! We seem to have lost our way on some of these things. I pray that we can reconnect with these items that provide us with the true riches in life! Thanks Maidena for your insight! I think of the waste in our country. How do we expect our children to learn family, when they waste time on electronic devices instead of conferring with each other in the same room? How do we expect them to learn to live slower, when mom and dad are gone so much from the family? We involve the children in so many sports activities, that it leaves little time for basic family functions, like chores, and prayer. You have a clearer view since you have experienced these poorer countries. I worry that we cannot get back to the basics when televisions, communication devices and vehicles and homes wastes away our time. I have the same fears. You see the simplicity in life when you have little. Our society continues to speed up, gather more, and isolate. As parents, we need to make some tough choices with our kids to maintain the focus on the family. Costa Rica is not immune to this. We are slowly infected them also. Most of the kids have smart phones, texting, Facebook. Like I said- the genie is out of the bottle, however, I believe that we can protect our families if we are willing to fight against it! Thanks for your insight Darlene! Great words brother. We are blinded by our socialization so significantly that our denial overshadows truth.